Have you discovered it is essentially impossible to create pro-level lines out of modes and scales? Wouldn’t you rather be playing at jam sessions instead of spending a fortune on instructors who insist on teaching you endless theory? Robert teaches you the “under the hood” behind his mind boggling jazz lines in this 8 hour two DVD set. Have you discovered it is essentially impossible to create pro-level lines out of modes and scales? Wouldn’t you rather be playing at jam sessions instead of spending a fortune on instructors who insist on teaching you endless theory? 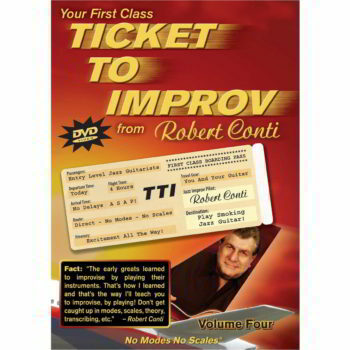 If so, Robert Conti, has again redefined high impact instruction, as The Jazz Lines is his Twenty-Sixth Blockbuster DVD of immediately useful “take it to the gig tonight” lines and other ideas. The early greats continuously evolved their improv skills by playing in bars, clubs, buses, and back room jam sessions from New Orleans to New York. Through ongoing hands-on exchanges of knowledge, they taught each other what they were playing on their instruments. In essence, the key ingredient to their continuous improvement was actually playing jazz, not talking about it. As evidenced by endless student testimonials, the cornerstone of the Conti approach is his ability and willingness to teach students to play jazz, by actually having the student play jazz from the start, not modes, scales and other nonsense. 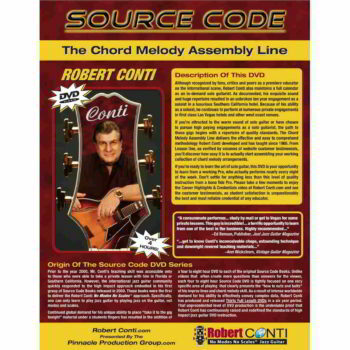 Indeed, nobody brings their “A-Game” knowledge to Jazz Guitar instruction like Robert Conti. From the intermediate to professional level, the concepts presented in The Jazz Lines will quickly breathe new life into your solos with a truckload of fresh, creative and exciting ideas. 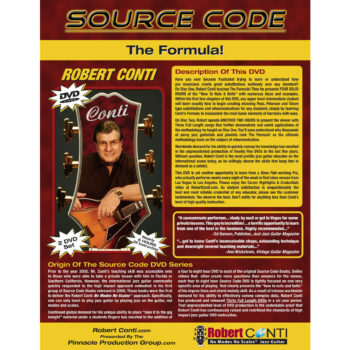 At $39.95, you now have access to Robert Conti’s knowledge at the rate of $4.99 per hour of professional instruction – an unbeatable price worth many many times the cost of admission! The Jazz Lines DVD/booklet is an eye opener. I’m taking it slow on that but I see enormous change for the better in getting something that “really sounds like something” if you know what I mean. I’ve known for at least ten years that modes and scales are pretty much useless except for warm-up / finger exercises, But didn’t understand how to go about constructing solo’s with arpeggios or any other method. Tying in to what Mr. Conti says about jazz guitar greats I read a quote somewhere, that the great ones that people call geniuses usually ‘just find or create their own method of handling musical materials’ something that makes sense to them. They’re not thinking scales or modes. Well, 99.9 % of the time. I’ve heard Wes zip up a scale to start a solo but it was sort of a special effect. I have been absolutely loving your source code jazz lines! I think it is the best jazz improv educational material there is. Perfect companion for the Ticket to Improve DVDs! I am ordering this today. I’m impressed with what I’ve heard and seen so far. I’m also hopeful that I can play like this! Dear Bob, I’ve been studying jazz for years, working on modes and scales diligently, but finding the process tedious and frustrating. Within a week or two of working through Jazz Lines, my playing was transformed, and I took to the stage with my first jazz gig, negotiating all the changes with total confidence.. and more importantly, I enjoyed every second of it! Your lines provide an incredible framework for learning this language, and your methodology makes playing this wonderful style of music an absolute joy, rather than an intimidating intellectual exercise. Now I can switch my brain off, and switch my ears ON!! Cheers Bob, your approach has ‘unlocked’ my playing! I’m indebted to you! Mr. Conti, I just got to the end of your Jazz Lines book, I got it back in December, so much good stuff, I feel like I should go through it again in case I missed something, when I noodling at the music stores people ask me where I learned some of that stuff, I tell them Robert Conti, your stuff really unlocks the door to jazz playing. Hi Ann! The above book/DVD is something every guitarist should have in his musical library no matter at what stage of “jazz guitar”level they are at as of this time! Now that is some opening statement, but it is meant sincerely. I have been playing on and off for more years than I care to remember. This treatise has rejuvenated my entire way and playing. What switched me on was when I got to ref37. “the lights” went on. The “After the Gig” section is priceless and should be a complete tome on its own. It certainly wakes your ears up. In fact sometimes I’m playing then I start listening to what I am playing-get carried away and that’s when the mistakes occur by thinking. So”get it under your hand” and your ears will show you the lines. I would like to thank you all and especially Robert for the amazing help his products have given me since buying them a few weeks ago. I have been an absolute fumbler on the guitar on and off for years, during which, the guitar spent most of its time in the case. The prospect of ever playing any sort of jazz to any degree at all, was, well a complete dream to me. However, I made a take of my noodlings today for the first time over ‘All Of Me’ and somehow a lot of what I have learned in the first few pages of The Jazz Lines produced a starting point to where I would like to head. You can rest assured that I will be pursuing my study under ‘Bob’ (if I may) from now on. I have never attempted this sort of music before as I always thought it was for the elite, but with your ideas and simple approach which is so clear, I now feel and hear that I could slowly get to grips with some of the changes. I have not attempted anything too clever at present, however, I found an added bonus inasmuch as they are opening my ear up so much to all the musical possibilities. I can’t tell you how much I hope I can learn enough to try and play in a similar way to my hero the mighty Charlie Christian. God bless you all and once again a huge thank you to all involved in producing and sharing this marvelous treasure trove! Well it’s official. 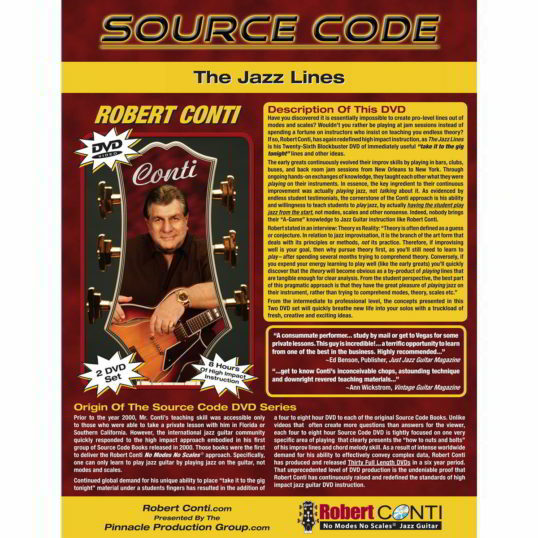 The best jazz study guide on the market is out – Source Code DVD – The Jazz Lines. If you can only buy one of Mr. Conti’s products (anyone’s products!! ), this is it. I don’t see how the book was effective until this DVD came out. Listening to Mr. C explain stuff in a one-on-one relaxed way, made it all come together. And he’s very entertaining (which really makes you not want to stop the DVD) because he still gets excited about the stuff and his sig lines such as, “*laughs* works every time”; “get the liiiiiines under your haand”, “what was I thinking? I wasn’t thinking of any of that!” LOL. Classic lines! All of course in the mafia Philly Italian accent haha. The way he shows you things and explains things really gets you excited to learn because not only is it the best and easiest way, but it’s the street way – the way that says, “you don’t have to know this and that…I don’t and look at me!”. Best motivation to play ever. This DVD changed my playing and ive only had it for a couple of weks now. OH yeah…EIGHT HOURS! PS Take it easy on Steve and Rob next time lol! Robert Conti’s material really works, I’ve only been practicing his jazz stuff for 6 months and have seen a big improvement in my jazz chops. I am a pro guitar instructor on LI New York, and currently teach 50 students a week. The problem with most jazz instruction is you don’t learn a good quality of vocabulary or lines. Robert’s lines actually sound like bebop and not cheesy. When you work with them after a while they become part of your musical personality and you start to employ them in various situations. This is ground breaking stuff, also his chord teaching approach is hands down the best. I think we should all just move in with Bob…. lol – but there won’t be much room in the kitchen with tens of thousands of us! The off the sheet tips teach me a whole load of useful information and/or make me crack up laughing, now that’s great teaching and always holds my interest. I refer particularly on how Bob hates self ordained jazz guitar ‘experts’ who make money misleading people. Now I can see the light getting brighter, I am also sharing his disgust for such rip off merchants who hide behind the public’s classic view of jazz as being some kind of arcane skill beamed to earth from another planet just to get their money. Of course, I cannot completely rule out Bob himself being a super intelligent alien, the way he manages to penetrate my own thick skull isn’t too far from Science Fiction! I had this nightmare the other night that robertconti.com shut down and I couldn’t get anymore DVDs BRRRR, it brings a shiver down my spine just thinking about it! I better stop! Cool lines and ideas with great explanations. The Jazz Lines was very comprehensive, it made me think less while playing. I am more comfortable playing up and down the neck more than ever! The off the sheet tips teach me a whole load of useful information and/or make me crack up laughing, now that’s great teaching and always holds my interest. I refer particularly on how Bob hates self ordained jazz guitar ‘experts’ who make money misleading people. Now I can see the light getting brighter, I am also sharing his disgust for such rip off merchants who hide behind the public’s classic view of jazz as being some kind of arcane skill beamed to earth from another planet just to get their money. Of course, I cannot completely rule out Bob himself being a super intelligent alien, the way he manages to penetrate my own thick skull isn’t too far from Science Fiction! Just wanted to say I’ve received The Jazz lines. I have been playing for a number of years, but Well, well well what can I say. I’ve gone through the first few lessons and I’m blown away with you explanations and clarity, you really do make this sound and feel so easy, the music I want to play I can hear myself moving towards it, it’s achievable. I have found that I’ve improved so much in understanding and expression already. I’ve changed my left hand technique ( I’m left handed). I’m surprising myself with the improvement in playing so early into the material. I feel like I’ve just started playing. A huge thank you. and keep up the great work. Perfect companion for the Ticket to Improv DVD’s! I am ordering today.